Peter van Niekerk is the Co-owner of the hugely successful Cape Garden Centre in Joostenbergvlakte, Cape Town. Cape Garden Centre is a family owned business and in existence since 1996. The business has grown organically since 1996, starting with six staff members. Cape Garden Centre is also home of the local - favorite restaurant Bamboo Restaurant and the kid’s playpark, Bugz Family Playpark. Would you agree that businesses that grow organically, you can control it much better? When a business grows too fast, it can run into some cash flow problems? His motto is to be super conservative.Make use of what you make today to be able to do something tomorrow. If you’re in a hurry, you can get stuck.When they open any new branches, they progress slowly. Over time, 5 to 6 years from now, they will grow into their potential. Being a business owner and entrepreneur for so many years, did you develop any morning routines or rituals that you use to set up your day? He hates planning anything. He has one day in the week, on Thursdays, set aside for appointments.Peter like to be flexible and available because his whole business is based on his customers. He has a morning routine which works brilliantly for him. He loves to sleep, get in his rest and wakes up when he must go somewhere. Five minutes after waking up, he brushes his teeth and heads out of the house. As soon as he gets to the office, he looks forward to their daily 5-10-minute staff meetings at the main branch. After the staff meeting, Peter, his best friend of 22 years and twin brother leave every morning to his farm in Stellenbosch to get some breakfast. They start the day just relaxing, having breakfast, chatting to the Farm Manager and Factory Manager. Nothing formal, but this is how he builds up speed for the day. Another habit he has in the morning is checking the weather (a part of the gardening industry) and exchange rates. This is very important, daily, as they do a lot of importing and exporting. Regarding goal setting, is there any specific way that you reflect upon your goals for the day, week, month or any long-term goals? His daily goal, turnover-wise, is measured by how the company performed that same day, the previous year. The branch needs to meet the same target or exceed it.Their long-term goals are much further spaced and practical as in other industries. Some of the goals include: opening another branch in Stellenbosch, developing a farm, build a few buildings and growing new stock.Their daily goal is to meet the same amount of cash flow they did the previous year, of that specific day. 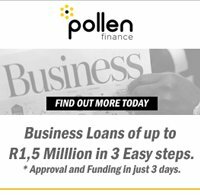 Based on the economy, that’s not doing so well, any suggestions to startup entrepreneurs currently in business going through the growing phase? Any tips for the entrepreneurs? Listen to what someone is telling you even if you don’t agree. Hear them out.Be open to criticism and take it for what it is. It’s not personal. Be prepared and be able to answer the most basic questions of your product. Basic questions such as pricing structures and markups. Being unprepared leads to a bad impression. Very crucial: Don’t run, before you can walk. Think and ask basic questions.If you want feedback on your product, don’t ask your family. They will give you an answer you want to hear.Don’t be shy to go into the face of the public and ask for people’s opinions. Expose yourself to what you sometimes don’t want to hear.Go out there and show the people what you want to do. If you must explain too much about the product you are selling, you already have a problem.Don’t hoard your idea but show people. Advice and opinions are free.Don’t spend money, until you have formed a good understanding of your business. Any two books that an entrepreneur should read, what comes to mind? He doesn’t recommend any books entrepreneurs should read but advice that everyone should read.Reading releases the mind and takes the stress away. Peter van Niekerk reminds us that we can learn and gain inspiration from the people we meet. Don’t focus on the negative in someone because you might not see the good. When you meet someone, who gives off positive energy, feed off it, it will rub off on you. It is free for everyone.